He’s saved her. He’s loved her. He’s killed for her. Eighteen-year-old Archer couldn’t protect his best friend, Vivian, from what happened when they were kids, so he’s never stopped trying to protect her from everything else. It doesn’t matter that Vivian only uses him when hopping from one toxic relationship to another—Archer is always there, waiting to be noticed. Then along comes Evan, the only person who’s ever cared about Archer without a single string attached. The harder he falls for Evan, the more Archer sees Vivian for the manipulative hot-mess she really is. But Viv has her hooks in deep, and when she finds out about the murders Archer’s committed and his relationship with Evan, she threatens to turn him in if she doesn’t get what she wants… And what she wants is Evan’s death, and for Archer to forfeit his last chance at redemption. Hushed starts with a murder--how's that for attention grabbing? It's the very first scene in the book, and when I read it I admit I started freaking out a bit. I mean, the main character, Archer, is a murderer, I wasn't so sure how I felt about that. But I kept on reading, and slowly things were explained. Did that mean the murders stopped? Nope, there is death galore in this book, but it's not for malicious reasons. At least, most of it isn't. In the beginning, I wasn't sure how to feel towards Archer. Do I hate him because he's a killer? Or do I have sympathy, because he believes he's doing the killings to exact justice on the people that terribly hurt his best friend, Vivian. Archer is a very cold person, at least on the surface, and I just couldn't get close to him. But, as the book went on and we got more of a backstory, I really did start to feel bad for him. And then when he realized that he couldn't live the way he was living, I gained some respect for him. He knew what he was doing wasn't right, and he wanted to change. As he put it, he didn't want to be a monster anymore. By the end of the book, I actually really liked Archer because he was trying. Evan was by far my favorite character in the novel. He cared deeply for Archer, and wanted to help him with his problems, but at the same time he knew that he couldn't let Archer drag him down either. Evan was like the anchor for Archer, helping him get his life back into place and disentangle himself from Vivian. It's mentioned several times in the novel that Evan is full of light, and he is--he's the perfect counterbalance for Archer's darkness. This is not a book for the faint of heart. It deals with a lot of heavy subject matter, murder being only one of them. I recommend reading this book somewhere sunny and open, because it can get pretty intense at times. But it was that heaviness which drew me into the book. I was fascinated with how someone could be so messed up, and I'm not even talking about Archer. 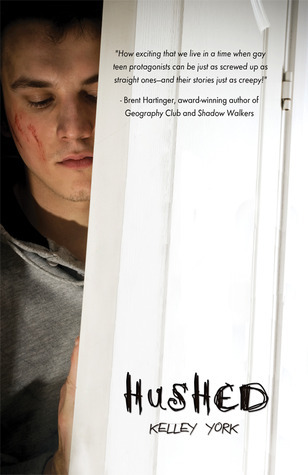 Overall, Hushed was a really amazing novel, one that I would recommend to any fans of YA thrillers. 5 out of 5 stars.